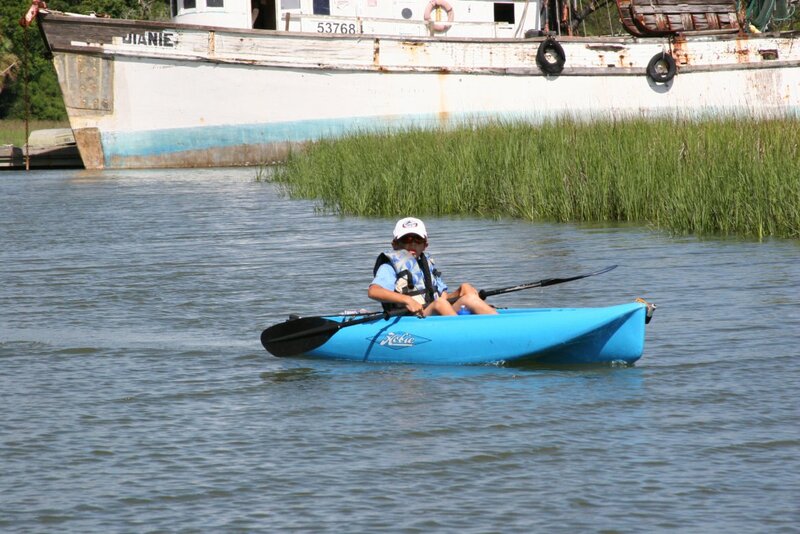 There are many types of fish in which you can kayak fish for here in Hilton Head. The kayak has long been a means of transportation and a silent means of to approach easily-spooked fish, such as cobia and flounder. Kayak fishing has gained in popularity in recent years due to its broad appeal as being environmentally friendly, a healthy method of transportation, along with being a relatively low cost of entry and mobility compared to motor boats. 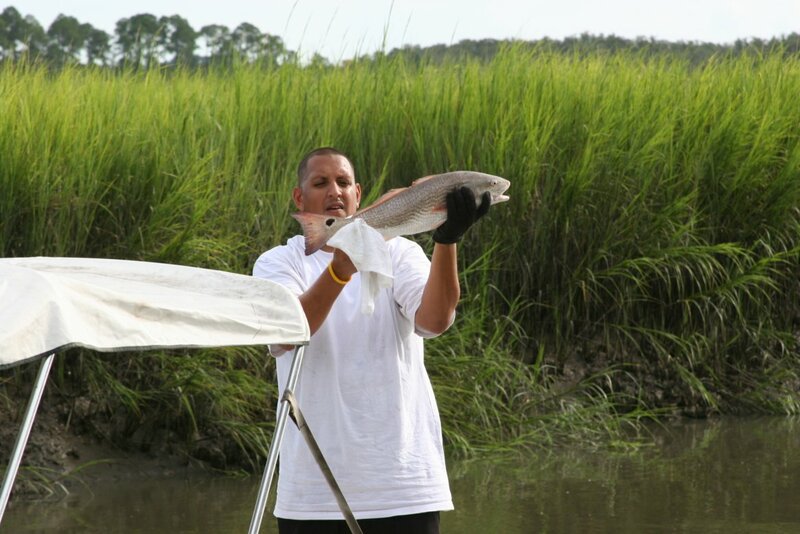 If you could kayak fish for only one thing here in Hilton Head it would be by common name, redfish. Which is also known as spot tails, bull reds, drum fish, red drum, and channel bass. These fish are one of the best sport fish between Virginia to Texas with some of the best action in South Carolina. One of the best things about these fish is the fact that there are so many different ways to fish for them and they are readily available just about year round. During the winter months the water becomes cooler killing off some of the algae allowing the water to become a little clearer. During this time you can kayak quietly in shallow water of the creeks where you can find schools of Red Fish swimming along the bottom. During the summer look for tailing redfish on the short grass flats. You can wade out to fish with old shoes if you know where to go safely because of the risk of pluff mud being slippery and when you have a good footing sink down and sticky. 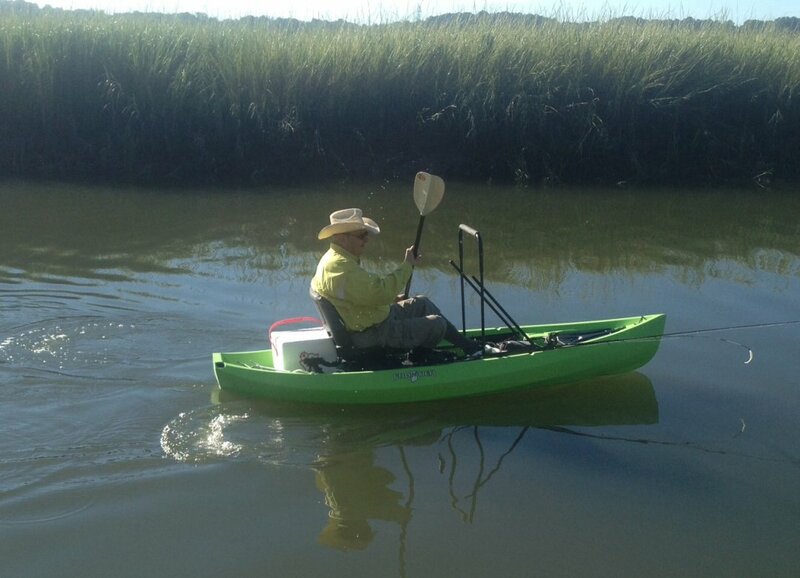 Or, stay drier by kayak fishing in those areas where it is difficult to get a motor boat access. This becomes a great time for sight casting and can be accomplished with fishing kayaks like NuCanoe with increased fly placement accuracy improving your catches. Either time, you can see why kayak fishing is taking off to be able to quietly access the areas. 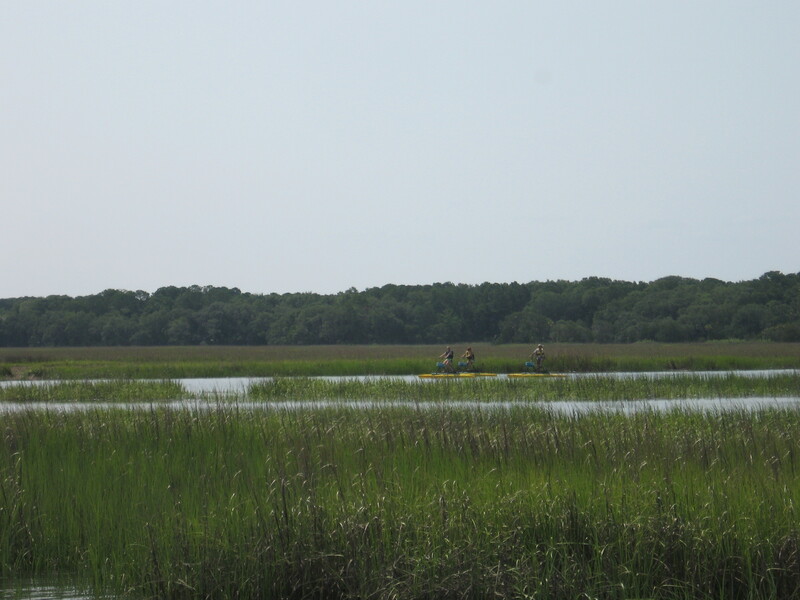 The estuaries inshore (ie: marsh grasses, tidal creeks, oyster bars and mud flats) is where the redfish begin their lives providing a great place for kayak fishing. These areas offer shallow water mud flats, baiting along the oyster bars, grass edges and creek mouths for sight fishing tailing redfish. One of the best and easiest ways to access these areas is by kayak fishing. It is the belief that for the first 4 years, these fish only move within a few miles. 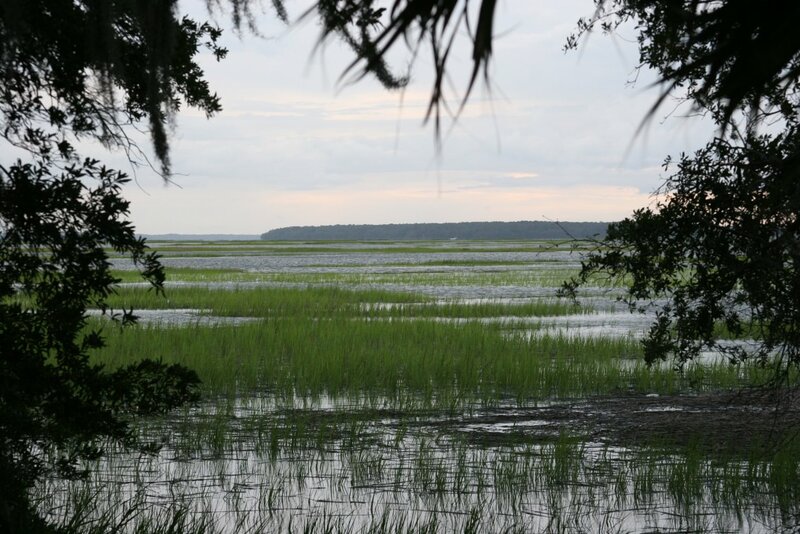 The inshore estuaries provide mostly food and shelter. This is where the redfish will grow up eating small bait fish, shrimp and crabs. At the same time, redfish are trying to avoid being prayed on themselves within the protection of the marsh. Roughly after 4 years and being around 7-10 pounds, redfish will stage up and move offshore to breed with other adult redfish. 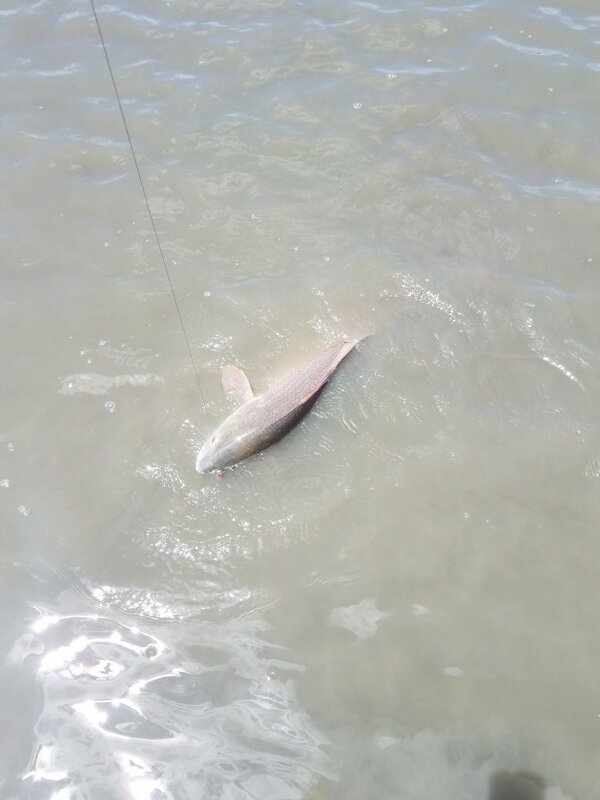 Mature redfish for the most part will spend the remainder of their lives in offshore waters. An exception in Hilton Head is during late summer and fall when these fish (now known as bull reds) come back to spawn where you can catch them in the surf and in deeper water near the sounds around the island. The big bull reds can weigh between 25 and 40 pounds. Most of the year the inshore shallows are popular with the little redfish. There are many different ways to go after redfish and vary from using dead and live baits to artificial lures to fly fishing the open flats. A favorite is sight fishing with light tackle using artificial lures and flies out of the flats boats or kayak fishing. 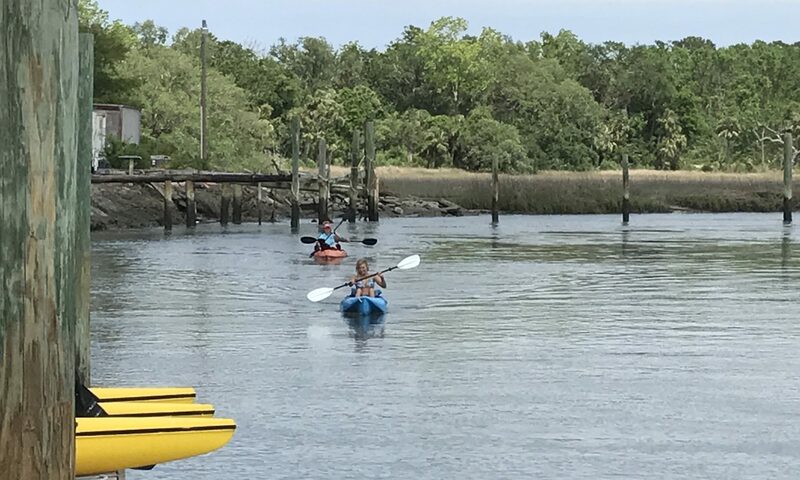 At Jarvis Creek Water Sports we are offering the NuCanoe Fishing Kayak for those looking to try or enjoy kayak fishing for 2 hours up to a week rental while in Hilton Head. ** It is always recommended to check tides and weather before you go out kayak fishing. Saltwater estuary fishing is primarily fishing in the backwaters around creeks, grass edges and oyster bars. There are huge tide swings in Hilton Head which range between 6.5-11 feet with an average of 8 feet. Because of this, boats and people who are kayak fishing need to pay attention to the tides so not to be stranded until the next incoming tide. With so much water flowing between the low and high tide, the fish will be in different areas depending on the stage of the tide. 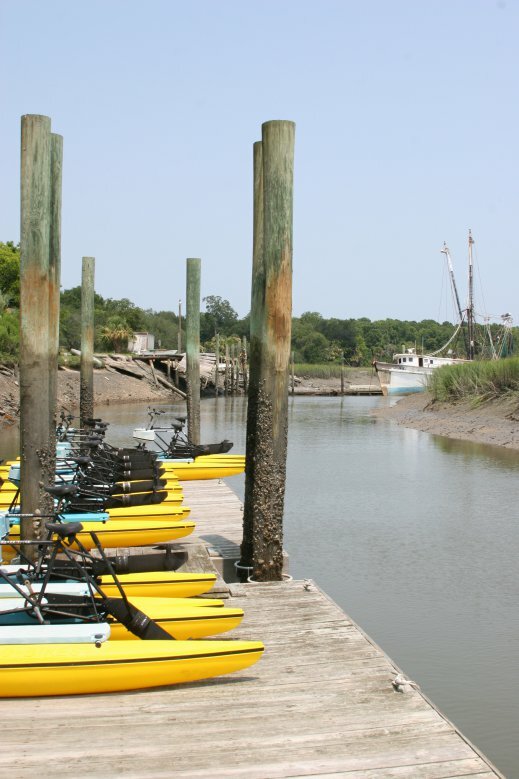 Basically on low tide fish will be pushed out onto the flats of shallow water creeks. As the tide rises, they hover around the oyster bars and then into the creeks. 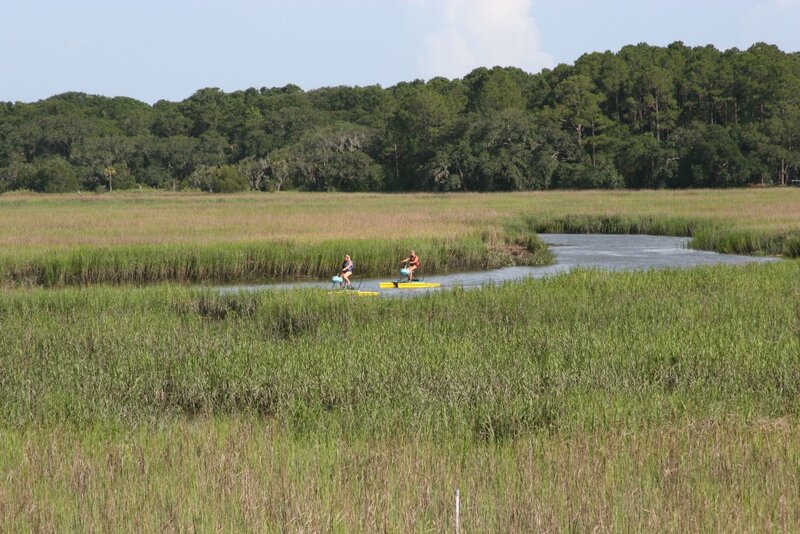 As we approach high tide the fish will move into the spartina grass areas of the creeks, aka short grass flats. 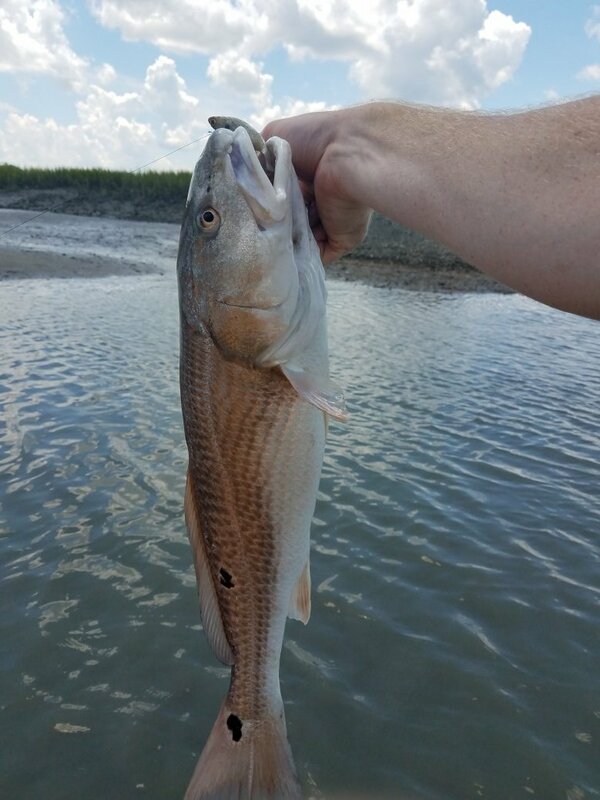 Around the higher stages of the tide, it is recommended to fish with live baits and artificial lures for species such as Red Fish, Speckled Sea Trout (the main two fish targeted), Black Drum, Flounder, and Sheepshead . This will make a fishing day to remember as you tend to catch a variety of different fish and steady action. This type of fishing is enjoyable for everyone from the beginner to those of you who have fished all over! Just remember for the most part estuary’s act as nurseries for a lot of wildlife, so a lot of fish maybe more catch and release then keep-able size but either way it is still a fun day on the water. 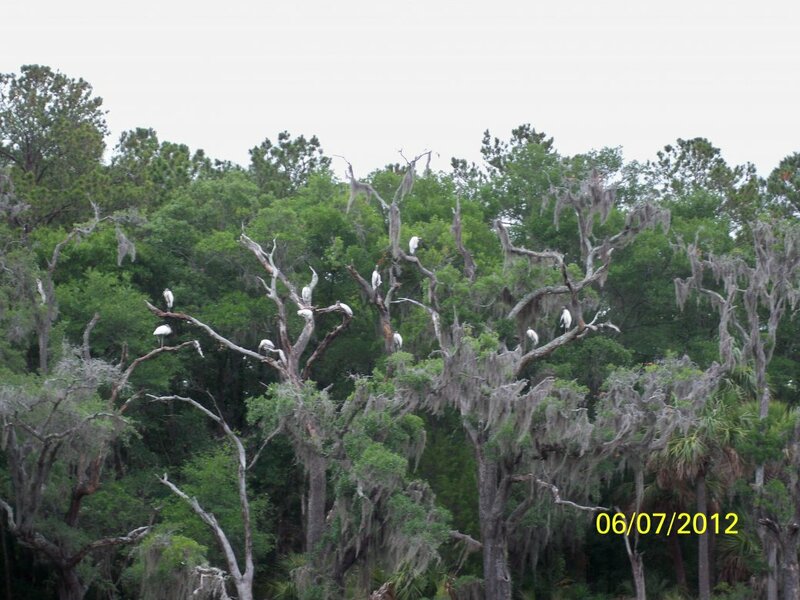 In the main inshore saltwater fishing areas such as the Inter-Coastal Water Way, Calibogue and the Port Royal Sound. The sounds and some deeper mouths of surrounding feeding tidal rivers offer many options in sport fishing. In these areas is where you catch some of your larger inshore fish such as cobia, tarpon, bull redfish and sharks. There are also smaller fish such as black sea bass, whiting, blue fish and spanish mackerel found in these areas. The spring, summer and fall months tend to be the best time of the year to fish inshore around the sounds. There are many options to fishing these deeper waters that range from dropping anchor and bottom fishing or trolling or sight fishing for fish cruising on the surface. Although it is not recommended unless experienced in kayak fishing for some, for others kayak fishing would be better in the estuaries. No matter how you fish, fishing the inshore waters makes for an enjoyable and relaxing day. Each time of the season can influence the fishery. During winter with clear water brings huge school of Reds with better results around low-tide in the shallow creek waters where the Reds will be schooled up on low water levels for sight casting. Tailing fish during the warmer months up in the tidal short grass flats and big Cobia who enjoy the warm sunlight of spring pushing up the inshore rivers. What are the fish reports in the are? Here are a few good places to look at which might help; SC Fish Report, Go Fish SC, Orvis Fishing Report, Whats Biting – Seasonal Guide. What are some beginner kayak fishing essentials? Here is a good article about essentials while kayak fishing. Any recommendation of gear for a day of kayak fishing? 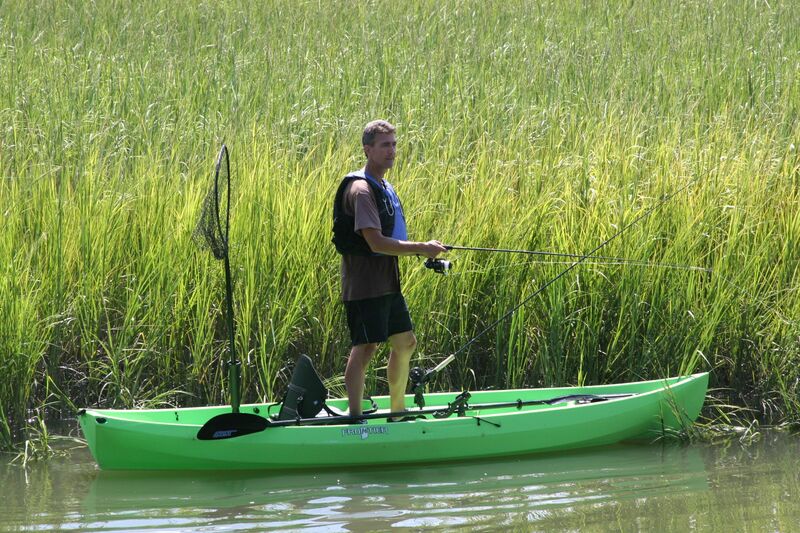 Check out this article of a few things you might want with you while you are kayak fishing. Any tips for a new kayak fisherman? Another article I will refer you to as a starting point, “Tips For New Kayaker Fisherman“. And “Kayak Fishing in Saltwater” of the new trend. What are popular fish in the area? Drum Family (Redfish, Red Drum, Black Drum, Puppy Drum, Red Bass, Channel Bass, Spot-tail Bass, or Spotted Sea Trout (aka Speckled Sea Trout)) are very popular but also Flounder, Whiting, small Sharks, Sheepshead can be pretty much found year round with Cobia, Ladyfish, Tapron and Jack being seasonal fish. Where can I put in the kayak other then Jarvis Creek Water Sports dock? Reference a starting map we made of locations to assist in put in / take out points. Where can I get a fishing license? At SCDNR online (and State fishing information) or you can easily go into Wal-Mart just down the road to buy the DNR licence there. Where can I buy fishing gear and/or bait? (map below) Wal-Mart, Dicks Sporting Goods, West Marine, and local professional store Southern Drawl Outfitters.